Tell all your friends--Pacific Standard poetry contest! "Making New York City Home." Winner to be chosen by Philip Levine. The prize is $250 plus broadsheet publication. We, the owners of Pacific Standard, a new literary bar in Brooklyn, can't think of any better way to christen our new watering hole than with honeyed lines. We'd like to make Pacific Standard a home away from home for both our patrons and our West Coast expatriate selves. So, for this contest, we thought it would be appropriate to hear how other displaced folks adjusted to the city. The winner will receive $250, and will be published in our first beautiful limited-edition letter-press broadsheet, which will be sold at the bar. Four other finalists will be heartily commended and given free broadsheets and a $10 bar tab. Some or all of our finalists may be invited to read in our upcoming poetry reading series. Entry Fee: $5, via check or money order payable to Pacific Standard, Inc.
Submission Deadline: Your entry must be postmarked by April 1, 2007. Winners will be named on our web site (see address below). Rules: Please send us only one single-spaced poem of 30 lines or less. You may send a poem that is under consideration elsewhere, but we ask that you notify us immediately if it is accepted. We have no preference for style or subject matter, as long as your entry fits the contest's theme. We vow to be as fair as humanly possible, but we do admit that we are Brooklynites, and this is a Brooklyn bar, so we may be unconsciously biased towards Brooklyn-related poems. The contest is open to anyone, even people who don't live in New York City (but, obviously, you'd probably need some experience of the city to write a poem about it). Do not include your name on your poem; give us your contact information in a separate cover letter. Entries will not be returned; include an SASE if you'd like to receive a response from us. Send entries to: Pacific Standard Poetry Contest, c/o John Rauschenberg, 214 14th St., Apt. 2, Brooklyn, NY 11215. Inquiries may be sent to fiatlux@pacificstandardbrooklyn.com. About Us: Pacific Standard is a cozy, relaxed microbrew pub at 82 Fourth Avenue in Brooklyn, slated to open in early April. We are committed to serving the local literary community with semi-regular readings, broadsheets, and a nice library. Read more about us at www.pacificstandardbrooklyn.com. Felix: "If a Chinaman says it's boring, it's definitely boring." Dude, Chinaman is not the preferred nomenclature. Also, he's Korean. I also picked up a coffee table on f*cking Avenue D, walked it all the way back to the R train, rode that to Pacific Street, and walked four more blocks to the bar, where my aching arms finally got a rest. We have to get you more pictures soon. Oh, and our handicapped accessibility problem has been solved, nearly as soon as it arose. Yet another phantom menace that needlessly freaked us out for a day or so. Italian plumber: "You need to get a plumber in here to change the gas lines. I'd do it, but I know you Chinese guys all have your own Chinese plumbers." "I NOT CHINESE! I KOREAN!" Italian plumber: "Sorry, don't mean any disrespect." Kevin: "This very important hole. It's for woman. She clog drain, you know? You have woman in bar, right? You need to use this hole, because they clog drain." Kevin: "You know, woman very messy, put many thing in toilet." Kevin: "You know, she put (making gesture at his groin) many thing in toilet." It took me until this final gesture to realize he was saying he used that hole to fish maxi pads out of the plumbing. Ah, Kevin. Anyway, the plumber has plunged us into handicapped-accessibility limbo. We need to figure out what to do about the two stairs that go from the front room to the back room to make them handi-friendly. We thought that wouldn't be a problem, but apparently our architect pulled a fast one on us. We'll talk to him tomorrow. was that we have a real chimney! 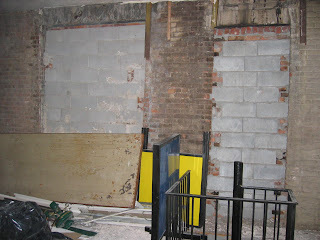 We finally looked behind the faux fireplace, and found a bare brick hole. But when you shine a flashlight up it, you see a long tunnel going, we can only imagine, to the top of our three-story building. How neat, we say. I think our new plan is to trash the stone fireplace cover and let our bare brick fireplace shine, perhaps with a rough-cut wood mantel. Any ideas? Mike Stan, Jon's dad, was in town. Matt Medlin, Mike Romanos, and I rented a U-Haul, went to Lowe's for construction supplies, then merrily drove up to Westchester County to pick up two couches for the bar. We also stopped at a furniture store in Queens, where I picked up a nice old yellow bookcase. All in all, a pretty productive weekend. 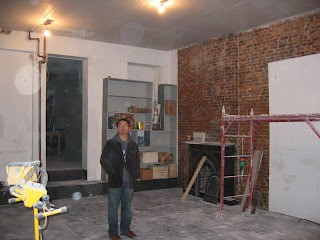 --Met with our carpenter, Jon, today, and finalized the bar layout and aesthetics. I think it's really shaping up well. Wait till you guys see the stained glass panels we bought. --We're getting a U-Haul van on Sunday to pick up more couches. Anyone have any other ideas for us while we have the van? Cool furniture/lumber stores? Places to get bookcases? --My stitches are out. Aren't you glad to get minute updates about the state of my fingers? --Electric and plumbing work should start next week. Routers, circular saws, and us. Yesterday, in addition to meeting with our walk-in refrigerator guy and our robot designer, we had a company cart away a huge amount of demolished material. It was very satisfying to watch all that scrap wood and metal and bags of drywall get crushed by a thunderous, smoke-belching pneumatic truck. In our new, refreshingly open and clean space, we began carpentry work. 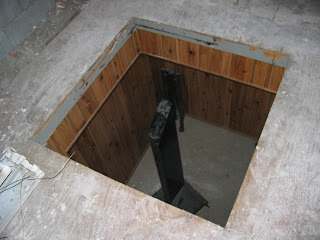 Our first job was the tricky matter of cutting an oddly trapezoidal piece of wood to fit in the hole in the floor of our back room. After much circular sawing and routering, we got a piece of plywood to fit. Now we just need to insert a few 2x4s as support and we'll be done. Next up is patching other parts of the floor and making our staircases less treacherous. This handyman-type work is really fun stuff, and it's a lot of fun to play with our toys. I think I'm going to try building some shelving and a big bookcase myself, now that we have the router. Wound clinic for me today. I pray my finger will return to health soon. Otherwise I shall send it to Italy for a rest cure. 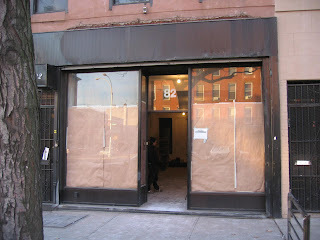 --We removed the huge "Color Sign" sign from the storefront. More accurately, Kevin removed it. He got tired of us diddling around high up on our ladders ("Look! He scared! He nervous! I go up! "), dashed up to the top of the ladder, undid screws, cut bolts, and took the sign down in a matter of an hour or so. --We hacked up and removed the metal staircase from the back of the bar. We jigsawed the crap out of the 1/4-inch metal pipe, cut the staircase in two, and carried each part outside. We were skeptical that anyone would want to take the staircase, but Kevin was confident. ("You bring metal outside on recycling day, 1-2-3, someone take it!") He was right. Literally before we put the staircase down, someone ran to grab a hand cart to carry it away. We also removed a bunch of other sign materials. Tomorrow, we're dumpstering all our other miscellaneous demolition byproducts, and will have a pristine space at last. --So, by the way, we now have a hole in our floor. Watch out. 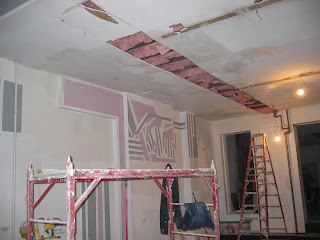 --The front room ceiling is done and primed and everything. Hurrah, etc. 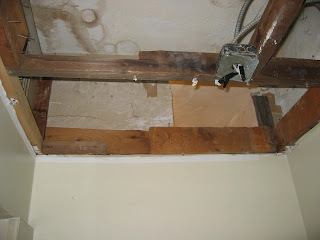 We destroyed the bathroom ceiling in order to let the HVAC guys install ducting above. Results of demolition in back room. We'll have to brick over these spaces. Bar after HVAC duct install (see shiny new ducting on right). Also, check out hot hot new ceiling. Gaping dangerous hole in back room after staircase removal. --Well, my lacerated left middle finger got infected. Umm, infected with bar fever, I'm sure, though the lab results aren't back yet. So I can't really use my swollen, tender left hand. I get to direct people like Brian and Jon around. 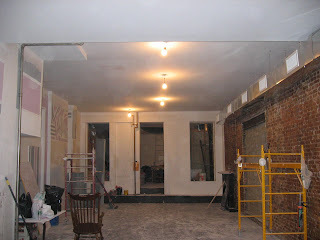 --Last week, we essentially finished the demolition. 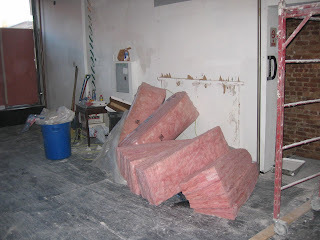 This week, we'll need to get a carting service to take it all away--the big piles of scrap wood and sheets of plywood, the long metal strips and flourescent light fixtures, etc. 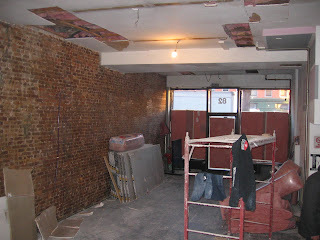 We're also trying to get some brick people in to brick over the holes our dry wall demolition created. --The HVAC people are in the place right now hanging shiny chrome ducts all over the place. 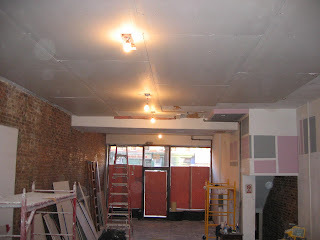 The ceiling guys are finishing up priming. Next up, we frame a second bathroom and get started on electric, plumbing, and skylight installation. 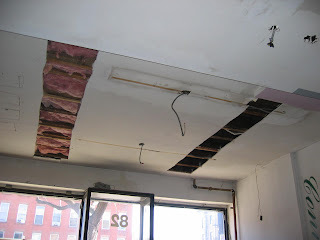 We'd also like to hang a tin ceiling in the back room. --I think that's basically it for now. Many pictures to come. 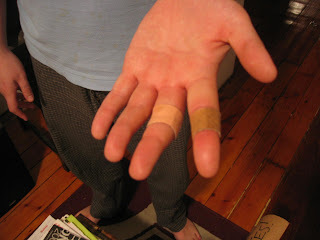 I forgot to mention that on Monday, while pulling down dry-wall, I was bitten by the bar. A jagged piece of metal attacked two of the fingers on my left hand, from which blood issued most copiously. I hopped in a car, went over to New York Methodist, and got a suture in each finger (without anaesthesia, because I don't front). They're healing, but my left hand isn't much use right now. Still, I'm actually pretty cheerful--I had wanted to bleed for the bar in some way. I'll feel like I earned it now when we finally open. Picture below (I won't subject you to the sutures, just the wrappings). 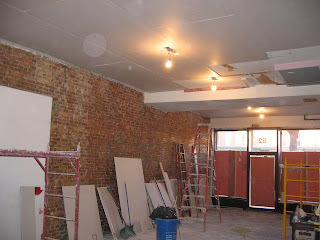 Things are moving along well with the ceiling. Today we also got the plumber into the space to evaluate things, had the HVAC guys back to figure out exactly what ductwork we need (they'll be back Wednesday to install), and had Sean, a carpenter who's building our beer sign, come by to check out our place. 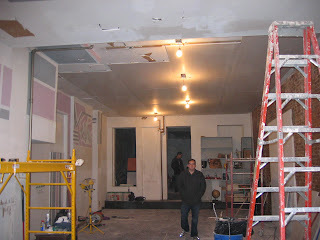 Brian came by and he and I finished the dry-wall demolition I started on Friday. There are several vestigial doors that we exposed, which we now need to figure out what to do with. Most likely we'll brick them up, but we're considering other possibilities. I went through a baseball card collection we inherited from our landlord in between meetings and demolition. Most of the cards are from 1973-78 or so; there are some great finds, and plenty of West Coast players. I'll have to take some pictures and post them soon. We're planning on using the cards on some of our tables and in our bathrooms. We're going to have two unisex bathrooms (our friend/savior Christian is designing the signs for them), but there's something unappealing to me about going with the basic "Restroom". I was thinking of fun non-male/female duos to put on the doors instead. I list my brainstorm below. Do you have a favorite? Do you have any ideas of your own? Just think, you could be the one to name our loos! Lots and lots of news. Full update soon. --7:45 am: Subway to bar space to meet with the contractor. We decide where to place the electric pigtails in the ceiling, as well as what to do about the beams crossing the center of the front room. --8:45 am: Bus to the architect's office. They give us the final, approved plans for renovation, and put us in touch with an expediter who can get our work permits for us. --9:45 am: Scrap planned trip to Fairway to investigate salsas. Bus back to the bar area. Hang out at Mule for half an hour. Walk across the street and met the expediter. He says he can have the permits for us in two hours (!). --10:45 am: Walk several blocks to Commerce Bank to do some financial business. Bus back home. --12:00 pm: Expediter calls us and says he's gotten the permits. We hustle back to the bar space by 12:30. --12:30 pm: Get permits and post them. We're able to do all our plumbing/electric/HVAC/renovation work now. Subway back home. --4 pm: Subway back to bar space to meet HVAC guy. --6 pm: Tap system guy cancels. We finally head out to eat. --9 pm: We go home! Huzzah! 8 mass transit trips in one day! 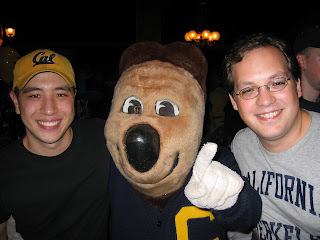 Jon and John say Go Bears, let's beat Stanfurd today!